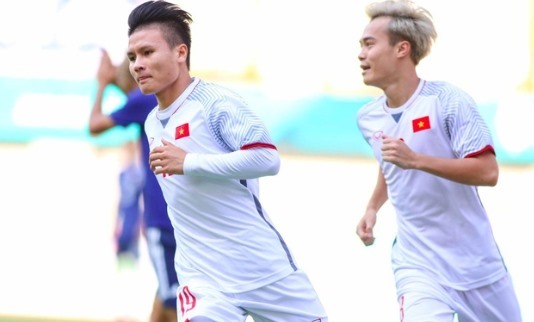 Vietnamese midfielder Nguyễn Quang Hải has been named the top star of the Asian Games expected to shine at the upcoming Asian Cup 2019 in the UAE in January, according to the website of the Asian Football Confederation, the-afc.com. Hải helped Việt Nam reach the semi-finals of the Asian Games (ASIAD) 2018 for the first time. Hải, the leader of a young and exciting generation of Vietnamese footballers, rose to prominence at the 2018 AFC U23 Championship, where his five goals helped lead his nation to a runners-up finish in China. The 21-year-old continued his fine form in Indonesia last month, scoring the only goal in an impressive 1-0 win over eventual runners-up Japan to secure top spot in Group D.
Hải was part of the Việt Nam side that then eliminated Bahrain and Syria to ultimately finish in fourth place, although his memories of the tournament will remain bittersweet after missing a penalty in the shoot-out for the bronze medal against the United Arab Emirates (UAE). Besides Hải, the website selected strikers Hwang Ui-jo of South Korea, Kim Yu-song of North Korea, goalie Mohamed Al-Shamsi of UAE, midfielders Ikromjon Alibaev of Uzbekistan and Wei Shihao of China.